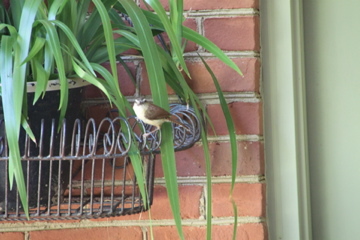 I believe this is a Carolina Wren because it has a white eye strip and a yellow chest. I understand mates are long term remaining together throughout the year. My information comes from, Birds of Alabama field guide by Stan Tekiela. They sing very loudly and my reading tells me the male is known to sing up to 40 different song types, singing one song repeatedly before switching to another. Female also sings resulting in duets. All the pics are made from the inside window . I would have scared them otherwise. For the last two years they chose to build their nest in a plant in this wire basket. The female incubates and the incubation is 12-14 days. Next time, I will document their activity. Both male and female feed their young. Because we sit on the porch so much we watched as they flew back and forth both male and female building their nest. You can't tell the male from the female. Their nest is a cavity and they have two broods a year, sometimes three. We counted seven eggs in our nest but my bird book says they have 4-6 white, sometimes pink or creamy, with brown markings. I wanted to make a picture of the eggs but it was too dark down in their nest. 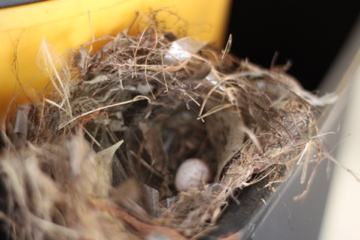 Before they built this nest they tried building a nest inside a wet vac hanging in our garage. This is the nest and it had one egg. They abandoned it because we shut the garage doors at night. This is not the shape of their nest I changed it to make the picture but is the best I could do climbing on a ladder. You can see the blurred pic of the babies here. I was standing on a chair and when they saw me they pulled their heads back in. The father and mother have worked so hard feeding their babies and I could tell their little chirping was getting stronger. I made the first pics yesterday morning and he was telling the world something. I was away from the house all afternoon and much to my sadness I missed the birds flying back and forth and the babies chirping. I looked in the nest and they were gone. It is very quiet tonight on our porch. I hope they will return to raise another family. Oh how sweet! Thank you for sharing the photos and information with us :) Have a beautiful evening! Hi Bonnie, I am so glad to meet a fellow blogger from Alabama! Your bird photos are amazing, how did you ever get the shot of the egg in the nest? I agree with your profile statement, you can meet and learn some wonderful people and things in blog land! Wonderful photos from through the window Bonnie! 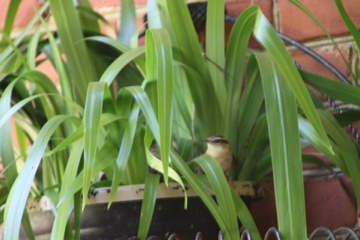 I didn't know about the wrens' repertoire of songs :) So fascinating to watch them nest! You know I have two matching baskets in "urn" style on my front porch with dwarf pine trees surrounded by violas at the base at the moment.